30 people were killed within the agricultural, forestry or fishery sectors in the UK during 2016 to 2017. Those were the startling facts shared with Welsh farmers during a Farming Connect event at Coleg Amaethyddol Glynllifon near Caernarfon, Gwynedd recently. 9 farmers are killed on farms in the UK per 100,000 workforce compared to 1.5 within the construction industry. “The industry realises that we have a problem, but individual farmers busy out and about on their farms day in day out are reticent to see that changes need to be made,” explains Brian Rees, Chair of Wales Farm Safety Partnership who led the event. Attendees were given the opportunity to see real life practical sessions bought from the farmyard to the event at Glynllifon. And farmers commented how successful and useful the sessions during the day had been, as they split into smaller groups to learn more at different safety stations during the event. Safe handling of livestock and diminishing risk of accidents were demonstrated using a cattle crush on site during one of the group sessions. Others were given an insight into how to operate an ATV or quad bike effectively, by using your own body weight to adjust and counter balance steep hills and rocky terrain. Farm machinery and a tractor was used at the third safety station, to demonstrate how best to stay safe whilst working the machinery and handling dangerous chemicals whilst spraying on the farm. Dyfan Parry Jones a young farmer from Maesteran, Penegoes, near Machynlleth said: “We heard a story from one of the trainers about a PTO accident, and how a farmer lost his whole arm in a freak accident. It happened in a second. Gwyndaf Roberts a beef and sheep farmer from Llanllyfni, Dyffryn Nantlle said: “The training was much more than I was expecting. It gave us a real insight to issue that affects us on farms. I was particularly interested in learning about the cattle handling system, and the tips and advice that was offered to us. For Huw Thomas, a beef and sheep farmer from Meillionydd Bach, near Aberdaron, Pen Llyn, attending a Farming Connect event was a first for him: “I was impressed by the fact that the trainers spoke to us as it is, in reality out on a farm. They obviously had experience of farm work and were level headed in their approach. 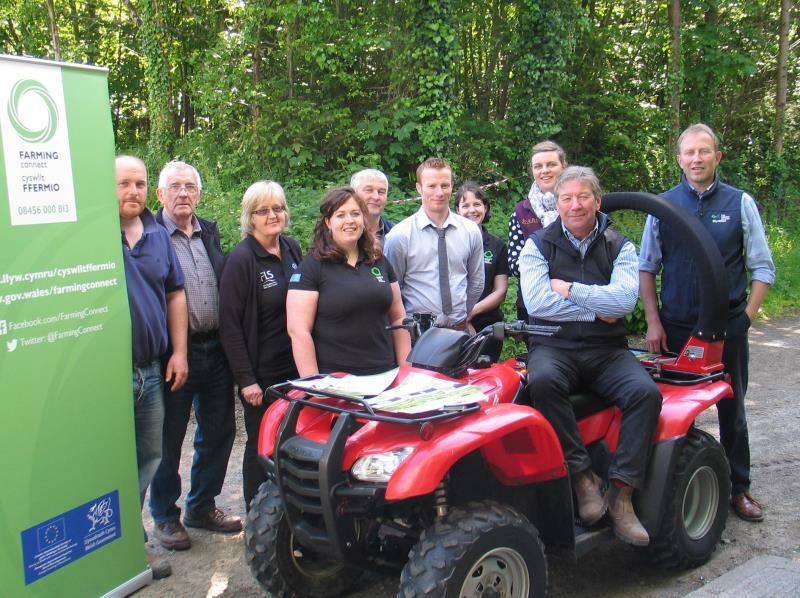 The event at Glynllifon was part of a two-day Farming Connect training programme, with another day offering farmers in South Wales the opportunity to attend the health and safety training at Coleg Gelli Aur, Llandeilo in Carmarthenshire. “We were delighted by the response from farmers across Wales,” explains Sara Jenkins, Development Manager for Farming Connect, the programme run on behalf of the Welsh Government by Menter a Busnes. Brian Rees, Chair of Wales Farm Safety Partnership said: “Our sessions may just prove to be a life-saver for some farmers as we showed that there are many ways in which you can reduce the risks of accidents and injuries to you, your family and employees. “It’s a fact that children who are killed in an accident involving a farm machine are killed in the path that runs from a farmhouse door to the machine itself. Visibility whilst sitting on a machine is a dominant factor, as small children cannot be seen at a certain level. Unfortunately, these tragic circumstances are continuing to occur on UK farms. The Farming Connect Knowledge Transfer Programme and Advisory Service is delivered by Menter a Busnes on behalf of Welsh Government. Lantra Wales leads on the delivery of the Farming Connect Lifelong Learning and Development Programme.